Well that’s some model name isn’t it! Luckily, the Mr Coffee machine is much easier to use than it is to remember! We have been trying and testing coffee makers to bring you some impartial advice when you’re trying to decide which machine to buy. Along the way, we tried this Mr Coffee BVMC-SJX33GT machine. Retailing at less than $35, this machine is our top pick for the best budget coffee maker. The price might be cheap, but that doesn’t mean the machine is bad which you will see through the article. This machine is suitable for.. This machine is not suitable for..
Delay brew timer: This feature means you can set the machine up and then set a timer for when you want the machine to start brewing the coffee so you can wake up to freshly brewed coffee. Freshness timer: This timer ensures the coffee you’re drinking is still fresh and will indicate when it’s time to throw it away! Brew strength selector: You can choose from a normal brew or a bold brew for added strength if you like your coffee to really pack a punch. Water filter: An added water filter removes the chemicals from your water giving you an even better flavour in your coffee. Brewing pause and serve: This feature is great if you’re brewing a full pot of coffee and you just can’t wait to get stuck in. You can pause the brewing process and pour yourself a cup then restart the brewing process. Auto shut off: This machine can be programmed to shut off two hours after you brew your coffee. This is great as it means you don’t have to be constantly aware of having to go and turn the machine off after the allotted time. An extended warranty for three or four years for a small additional fee. Mr Coffee thermal stainless steel decanter DRD95 if you prefer a thermal carafe. Mr Coffee GTF2-1 basket style gold tone permanent filter (this is a reusable filter that stops the need for paper filters. It retails for around $6 and if you don’t mind having to wash it between uses, it can save you a lot of money in the long run compared to buying paper filters. We were pleasantly surprised to discover that this machine works as well as any other model on the market. People say you get what you pay for. When we stopped to compare the list of features on this machine with the features on more expensive machines, it makes us wonder if that’s true. Are you paying more for things because you expect that cheaper products won’t work as well? If that’s the case, then you can relax. This machine works as well as any of the others we tested. The coffee tastes good. It’s consistently hot but not enough to leave a burnt taste. You can really taste the difference between a standard cup and a bold cup. This machine is ideal for anyone who wants all the bells and whistles without the huge price tag. Anyone who wants a machine that looks super stylish should perhaps steer away from this machine. It’s not awful, but there are better looking machines out there. Also, it’s not a good choice for anyone who doesn’t want to use filtered water. 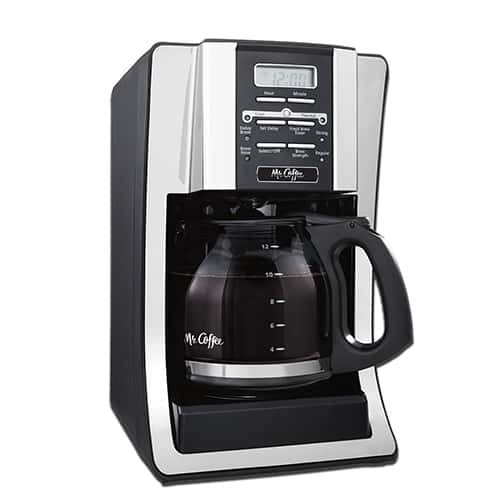 Overall, you can now see why we chose the Mr Coffee machine as out best budget buy. The machine does as much as any other machine out there (more than a lot of them) for a fraction of the cost. As you will have seen, we struggled to come up with any disadvantages of this machine. We would definitely recommend this machine to anyone looking for a new coffee maker without breaking the bank!